Captain Jack says to look at the moon. I am feeling queasy, and I was going over and over what I ate and wondering how it could be making me feel queasy, and then I realized that maybe I'm feeling queasy because I've spent about 9 (nine) hours today working stockinette stitch in the round. Blerg. The good news is, my sleeves are really, really close to being done. The bad news is, closing ceremonies were a little bit ago, I still have button bands to do, I don't even have buttons yet, and the notion of working sixteen more rows of garter stitch in the round makes me... well let's just say it would probably be better not to think about it. Motion sickness always, always sneaks up on me. I hate it. So, we could talk about how my failure to finish the sweater before the closing ceremonies might have something to do with the fact that I started my planning about a day before the Winter Olympics started. That seems logical. Or it might have something to do with how insufficiently dedicated I was to this project, spending valuable knitting time on mittens (that also aren't finished, aarg). Or maybe the ridiculously lax approach I take to issues of gauge continues to seriously impede my forward progress. Or it might have to do with my vulnerability to distraction with shiny new projects. We could talk about those things, or we could focus on some shiny new projects! 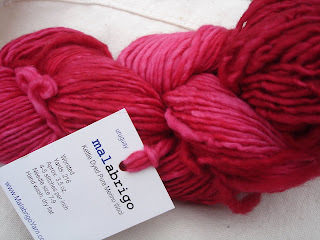 Chagrined about my lack of planning for the Winter Olympics, which I had known were coming up for, oh, about three-odd years, I started planning well in advance for Malabrigo March. but I got some and cast on for a one-row scarf anyway. The scarf was too wide, and the needles were too long, and it was all just so grotesquely pink that I put the project down and wandered off for three years. 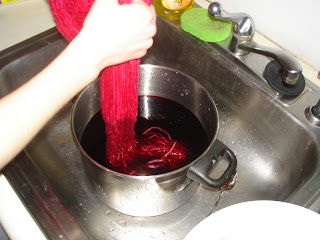 So of course the middle of the Knitting Olympics is the perfect time to make one's first foray into Kool-Aid dyeing in preparation for Malabrigo March! 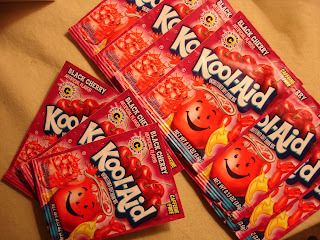 The What a Kool Way to Dye group on Ravelry has a ton of useful advice on Kool-Aid dyeing, so I read what they had to say, hunted down a bunch of packs of Black Cherry unsweetened soft drink mix, and went to town. 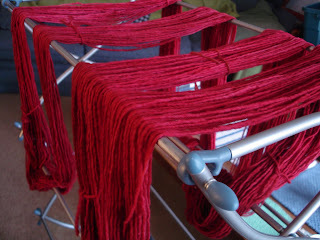 I used 9 packs of Kool-Aid for two skeins of worsted, and I now know that I should have used more. The rule of thumb seems to be one pack for every ounce of yarn for a nice color, but the more you use, the darker the color. 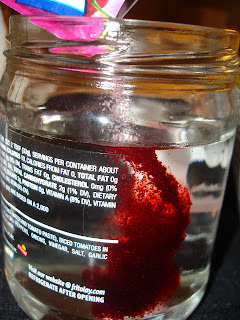 Husband came up with the brilliant idea of boiling a pot of water without any precious, feltable yarn in it, and then turning the gas down until it stopped boiling. 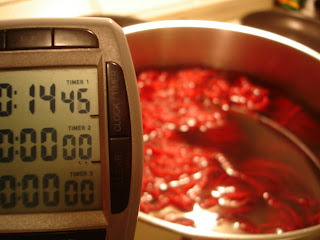 My plan involved waiting until it boiled, freaking out, and then way overcompensating by turning it down way too far, then swinging back and forth between too hot and almost off over the course of several hours. His way ended up taking longer than the about-30 I was expecting based off of internet tutorials, but probably still short of an hour. 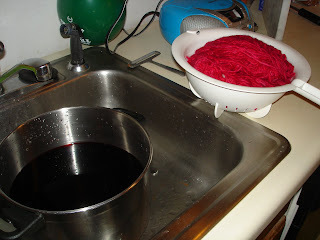 Probably the best thing about Kool-Aid dyeing is that you know exactly when it's done because the water turns clear, the dye having been all sucked up into the yarn. Here it is in a nice, possibly deceptive, low light. Still pink, but a pink I can live with. My original plan involved making the Daphne Hat and a Saroyan scarf -- in accordance with my new "Make Things That Actually Match" Initiative, but I'm not sure if there will be enough yarn. Maybe I'll start with the hat and then see what kind of scarf/cowly thing can be made out of whatever's left. There is an end in sight with the sweater, and the mittens, and maybe not so much the socks, but I'll start new socks soon, too. I knit like an Olympian yesterday. 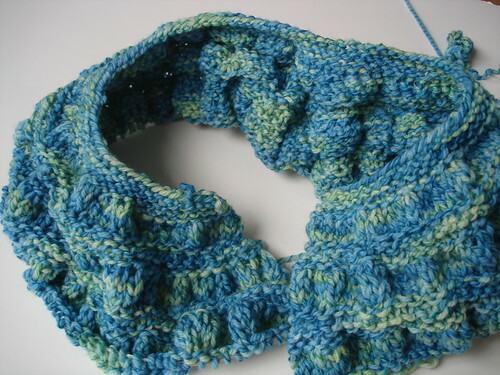 I knit for hours and hours. Today I find myself ready to do the waist decreases (that I'm adding), which means that after dividing for the sleeves, I've knit 8" of stockinette. In other words, now is the perfect time to find out that early gauge measurements were Lying Liars who Lied. Newer gauge measurements reveal that I'm getting 17 sts/4" instead of the 20 I should be getting. Because I like the fabric I'm getting and don't want to go to a smaller needle, it's time for math. Given the number of stitches that you're supposed to have after the last yoke increase, I'm finding that, with the given gauge, the piece should be 49.4" at the widest point. Measuring around the widest point of my shoulders in the shape of the sweater (i.e., not straight across but draping down a bit at the middle), I'm finding that I measure about 40.5", or 41" at the drapiest. Now, my math could be borked. That would be par for the course here. But I did it both by cross-multiplying and the other way I could think to do it, and got 49.4". 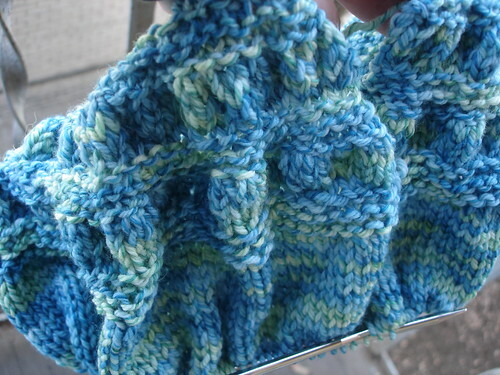 At first I was thinking that I'd frog back to the last yoke increases (SOB) and then decrease for some kind of back-dart-y thing, but now I'm going to probably just re-work the numbers and increase to a number that's not nearly as big. ...Or, because my target number is pretty close to the number left before some of the sets of increases, maybe I'll just forget those. Not quite the same as going 80mph headfirst on a track of ice. But at least it's a step up from sitting around eating cheetos while you watch people do that. 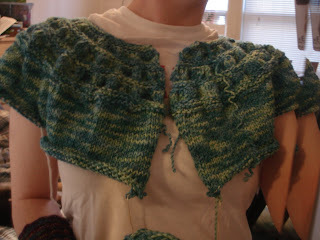 This is my tea leaves cardigan, in reclaimed Twisted. The pattern looks to me like a rather understated, formal-ish sweater, but in the screamingly turquoise yarn, I'm not sure what the effect will be. Other than AWESOME. Have I mentioned how much I love this color and this yarn? Yes? Okay, here's another picture. Here it is before I started back on it today. I'm using the 6s and 7s called for in the pattern, and the cords are shorter than the 32" called for, so the last ruched sections were rather unwieldy. And that fact also makes it difficult to tell how it's actually looking, because it's all scrunched. I'll divide for the sleeves soon, and should have a better idea then. Despite this being an Olympic commitment, I've been rather flighty about it so far. Some days I really don't have the time to work on it, and that's acceptable, but I've been spending train time on my cute owl mittens, which are coming along. And my co-intern's baby is arriving sometime between now and the end of March whether or not her blanket's done, so that has been getting some attention, too. Part of the problem, I think, is that I have no idea how long this will actually take me to make. 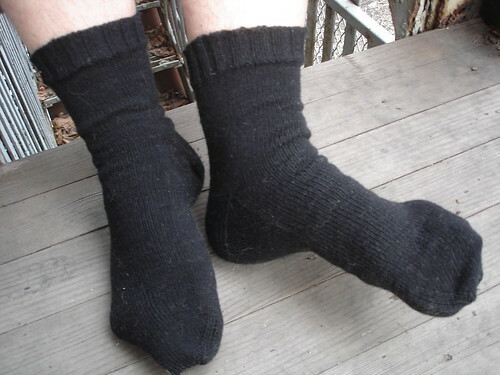 I've gotten the question before about how long it takes to make a pair of socks, and the best answer I can come up with is "somewhere between 10 and 50 hours." To be specific. Maybe the sleeves are small enough to be train knitting. This weekend isn't packed with schoolwork, which I shouldn't say too loud and which will probably never happen again now that I've typed it, but maybe I should set some kind of goal for progress by Sunday night. Hmmmm. Hidely-ho, pagarinos! 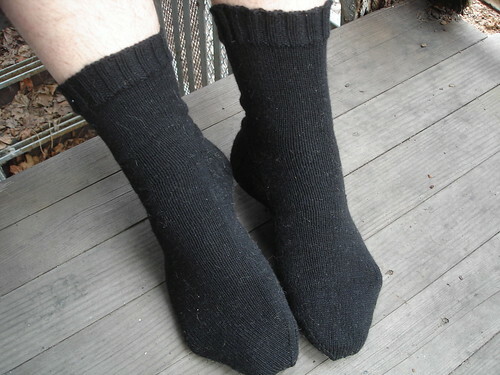 After deciding on about three separate occasions to just plow through and get it done, I have finished the Dipper Socks Project. These were started all the way back in July. Dang. 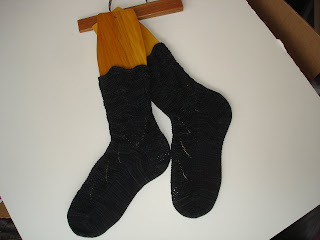 The second pair of finished black socks was started in November or December, and were slated for completion by 12-25. Whoops, that didn't happen. It's okay, Husband says, if you get them done by January 25th, I can wear them for my first class. That would be cool. Whoops, how about if I get them done by Valentine's Day instead? Because that, apparently, I can do. So what have I been doing, with a second shawl, colorwork mittens, a blanket, and yet another pair of socks on teeny tiny needles? 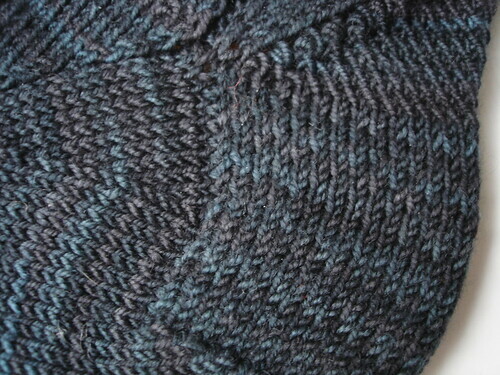 Working on a sweater for the Knitting Olympics, of course! I finally frogged Wicked, and after several days of considering sweater possibilities, I decided to go with the tea leaves cardigan from Madeline Tosh. It's a nice, sedate sweater and I'm doing it in Screaming Turquoise, so I'm not sure exactly what tone the final product will strike, but I'm really liking it so far. I'll post pictures when it's further along - right now I'm wrestling with one of the ruched sections, which doesn't really want to fit on my circ because it's a few inches shorter than what the pattern calls for. It's looking bunchy and radioactively beautiful. 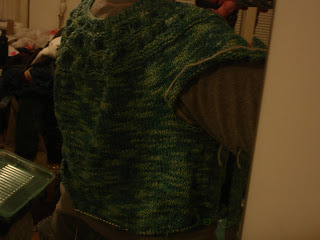 Once I separate the sleeves, it may be more recognizable as a sweater. In other news, I seem to have lost the little hand socks I made out of STR Pirate's Booty, which is very unfortunate, because my hands have been just freezing, and none of my other fingerless mitts are conducive to knitting in. I've been considering making replacements with my skein of Falcon's Eye, because I've noticed that the black shoes I wear my handknit socks with tend to make the lighter colors look grungy after a while. 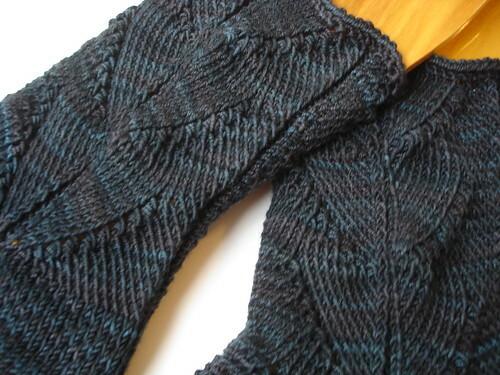 So the decision about what rib-ish pattern to use for those has been tumbling around my head, too. And finally, I've been saving my yarn scraps (and fabric scraps) for forever, planning to use them as pillow stuffing. 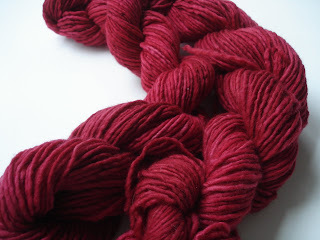 Short lengths of yarn seem like great stuffing material, because they're so warm and sproingy. My little rubbermaid containers are really starting to overflow, so a pillow project is starting to form itself in my head. Any suggestions for patterns (knit or crochet) that are really comfortable to really use as pillows, rather than just as decoration?